They may have lost the North Dufferin Baseball League championship series, but the Orangeville Giants turned out a stellar season that saw them go from a fifth place finish in the League standings to battling all the way through to game seven of the final against the New Lowell Knights. The final best-of-seven series got underway on Saturday, August 27, in New Lowell and ended with a 10-3 win for the Knights. The Giants tied the series in game two leaving their home diamond with a 4-2 win to tie the series. Moving ahead again, the Knights had 15 runs in game three while holding the O-ville team to a single run. The series reached a real turning point during a double header on Sunday 18, in New Lowell, when the Giants come out on top in both games to lead the series 3-2. “If they had won both games they would have won the series so us coming here and taking both games really scared them. It’s baseball, anything can happen,” said Giants coach Nathan Drury. The series double header placed the Giants back in the running when they came out on top in both games on the Knight’s home diamond. Returning to Princess of Wales Park in Orangeville for game six, the New Lowell team had a successful day on offence hitting three home runs – including a two run homer from Steve Baldry to end the game 8-2 and force game seven back in New Lowell on Sunday, September 25. It was the biggest crowd of the season as fans from both side turned out to watch what would be an epic game as the entire season for both teams game down to the seven innings on Sunday afternoon. The Knights took an early one run lead on a sacrifice bunt early in the game. Orangeville tied the game in the firth inning when Daryl bond led off with a single the made it to third base on a throwing error at home plate. Brett Chater finished off, hitting a single that drove in the run to tie the game at one. The Knight’s at-bat in the fifth turned the game around for the New Lowell team when Todd Gowan blasted one clear over the centre field fence and onto the road for a two run home run that put the Knights back in the lead. New Lowell’s Todd Patton followed up with another single run home run that gave the Knights a three run lead with two innings remaining in the game. 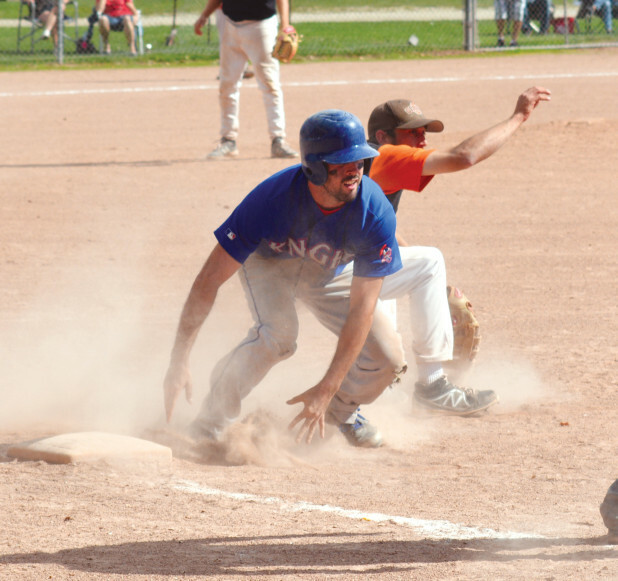 The final chance for the Giants in the final inning ended with a double play that left the Orangeville team trailing by three runs with two out. “We got a little further than last year,” Drury said after Sunday’s loss. “ We went to the semis last year and got eliminated by this same squad. This year we knew it was going to be tough. We competed with them but they seemed to have that little bit of experience on us. We had a great season. We took out the four seed, then the two, and we had to face the one and we went seven games so over all the season was a success. That was the goal this year – to make it farther than last year and we definitely did that. When the final out happened, the Giants had to settle for a 4-1 loss and hand the championship to the Knights.